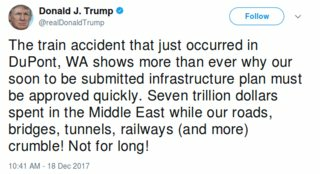 In response to the recent train accident in Washington State, the current President of the United States, Donal Trump, made a claim in a tweet that the US has spent $7 trillion in the Middle East. Is this true, and if so what's the (rough) breakdown? The statement is rather vague. Spending since when? Which expenditures count (cost for wars, cost for foreign aid, ...)? What counts as the middle east? And of course it doesn't factor in any potential benefits to the US. That being said, I could find no source for the 7 trillion number. But Trump did make a similar claim last year (back then it was 6 trillion). Politifact ruled that claim half-true. They name multiple studies which put the cost anywhere from 1.6 trillion to 6 trillion. But the higher estimates include money that is going to be spend in the coming decades on medical care for veterans, etc. The time frames on the estimates are also slightly different (all start in 2001 though), and they also differ in which wars they take into account. The DoD estimates that wars in the middle east since 2001 only cost 1.5 trillion. According to checkyourfact.com, the White House provided a study which names 4.4 trillion (as well as 5.6 trillion until 2056 including medical costs and 7.9 trillion including interest) to back up the claim. The study has the sub-title of "A Summary of the $5. 6 Trillion in Costs for the US Wars in Iraq, Syria, Afghanistan and Pakistan, and Post-9/11 Veterans Care and Homeland Security", which summarize the results pretty well. Did George W. Bush spend 32% of his presidency vacationing, versus Barack Obama's 5.2%? Does increasing the middle class result in lower birth rates? Is about 50% of world population middle class?